Since there were no microscopes to detect flaws in those ancient times, clean to them meant eye-clean. At present, the gem trade has lost much of its integrity because of the widespread treatment of natural gems to conceal or change imperfections. The oiling of flawed emeralds as a routine procedure is an obvious example of such treatment. The oil enters the gem through internal cracks which break the surface of the stone. After a period of time the oil dries and the flaws are again visible. If Emerald were flawed by definition then Shastras would not have recommended fine quality, because Shastra orders, “only eye clean” gems are to be used. Flawed gems are far less beautiful and can be a source of misfortune. Most people will not buy torn clothes or a new car with obvious defects. Almost no one uses cracked eyeglasses. Isn’t it odd that almost everyone uses flawed gems?Most commercial green beryl these days is heavily included…but that is the cheap stuff. 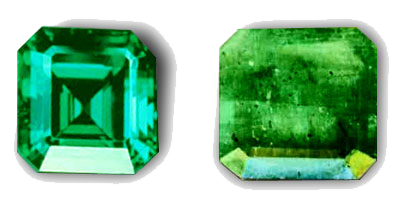 If people are willing and able to pay the price from $1000-$5000 per carat (cheaper than clean ruby) then they can have non-oiled clean emerald… But the poor people buy “cracked” and thus remain poor, and this fact makes the more well to do people NOT believe in Planetary Gemology. The reality is that cleaner and auspicious emeralds cannot be oiled because there are no internal cracks breaking the surface. There is no way for oil or anything to enter into a fine, ‘intact’ non-cracked single unit gem crystal of auspicious quality (health). A good way to think about gem clarity is to mentally compare the location and seriousness of flaws in a gem to similar defects in your own body. If there are minimal flaws in either a gem or your body, there is life and power. But if the defects are too severe, there is neither life nor power. Vedic texts state clearly that only amala, CLEAN gems are acceptable for use by thoughtful humans. Beside the Navaratna, or 9 primary gems, there are many other natural gemstone choices based on color. 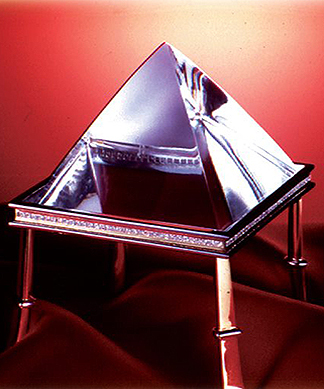 If one cannot afford the cost of a clean precious gem, one can choose an Upa-ratna, or secondary gem. For example: Instead of selecting emerald for the planet Mercury (Budha-graha), one can also use tsavorite (green grossularite), chrome-green or green tourmaline, chrome-green or green diopside, green peridot or green jade. Jade, being an “aggregate” (made up of tiny crystals all fused together) is less preferable than the other Mercury gems which are “single unit” crystals. There ARE eye-clean, beautiful unburned precious gems on this planet, but they are scarce and costly. Rather than select a flawed primary gem, it is far wiser to choose a flawless Upa-ratna, or secondary gem. These Uparatnas are less expensive than their precious counterparts, and yet conduct the same astral energy of their associated planet. They are also easier to find without flaws or treatment. See below for a list of all natural gems and their piezoelectricity associated planets. 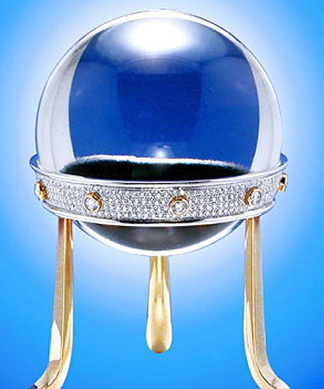 REMEMBER: Whatever gem(s) you use should be flawless, because according to ancient Vedic wisdom only “eye-clean” gems are helpful and attractive, while visibly flawed gems are defective and disturbing!